Expertly co-written by David L. Cooperrider (Professor and Chairman of the Department of Organizational Behavior at the Weatherhead School of Management) and Diana Whitney (President of Corporation for Positive Change), Appreciative Inquiry: A Positive Revolution In Change is an explorative introductory guide to a new and revolutionary method of change management. 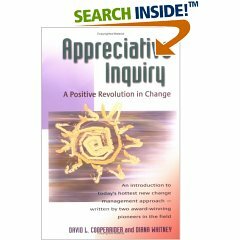 With an easy-to-use system, Appreciative Inquiry will assist its readers to encourage its readers to emphasize strengths to their employees as opposed to focusing solely on fixing weakness. Appreciative Inquiry is a well organized and “user-friendly” guide highly recommended reading, especially for corporate or business executives. I would like to commend [the authors] for Appreciative Inquiry, and for introducing it to the United Nations. Appreciative Inquiry gets everyone to focus on what’s possible through interactive discovery and design sessions. The output has been amazing.